The Poodle is noted for its ability in the water. It has also been known as the Caniche, which is its original French name. The word poodle comes from German pudeln, meaning �to splash�. Poodles are typically intelligent, alert, and active. Breed standards call for a dignified, elegant carriage. The poodle is often thought of as a typically French breed (it was originally known as the French Poodle), and numerous sources cite it as France's national dog. However, it is an old breed and its region of origin is unknown. 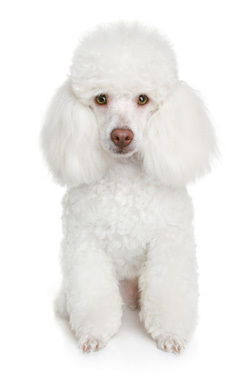 Most experts believe the poodle originated in Germany or Russia, but it may have come from Iberia. Related breeds are the Portuguese Water Dog and Irish Water Spaniel.